It had to happen and now it has. There were masses of ordinary cars at auction today, so they had to be cheap. And they were. Y reg Mondeos showed the way. A 79k mile 1.8 Zetec sold for £4,000, a 95k mile 2.0LX estate sold for £3,525, a 102k mile 1.8 Zetec sold for £3,300, a 98k mile 1.8 Zetec sold for £3,200, and the 108k mile 1.8LX in the photo sold for £2,850. In the same vein, Passats too were far from crazy money. 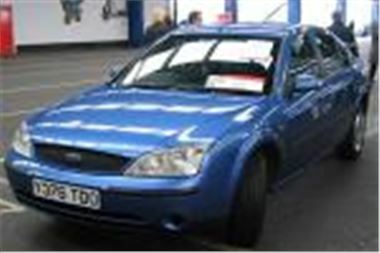 A 108k mile 2001/51 2.0SE sold for £3,850 and a 104k mile facelift Y reg TDI PD 100 for £5,050. Though that was confounded slightly by four old shape 2000X TDI PD 115 Tiptronics with mileages between 112k and 151k which sold from £3,925 to a silly £4,525. Some part-exchanges were for practically nothing. A 97k mile 93L Jeep Cherokee 4.0 sold for £1,500, a 126k mile 97R Renault Scenic 1.6RN for £1,150, a 63k mile 97P Alfa 145 2.0 litre Cloverleaf for £1,075 and a rare 130k mile 93L Australian Mitsubishi Signum 3.0V6 auto estate for a paltry £250. The more desirable stuff stayed dear. A 41k Y reg BMW 320i 2.2SE sold for £10,750, a 34k mile 2001/51 318iSE Touring sold for £11,500, and a damage repaired 16k mile 04 reg Audi A3 TDI 140 DSG for a whopping £17,700.